In a recent meeting led by Rear Admiral James Symonds (Commander, Navy Region Northwest), Shaari Unger of Naval Undersea Warfare Center (NUWC), Division Keyport, kindly handed out a CD with a great recording of transient orcas made in Dabob Bay (Hood Canal, WA) on February 10, 2005. She asked if any and all acoustic afficionados could listen to it and analyze it. I’ve converted the 425Mb AIFF file into a 15Mb mp3 archived on the orcasound.net server for easier, broader distribution. 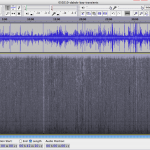 Open it in your favorite analysis package or player (like the free, platform-independent Audacity shown at right), add your second-by-second notes to the public Google spreadsheet, and/or comment on it here. 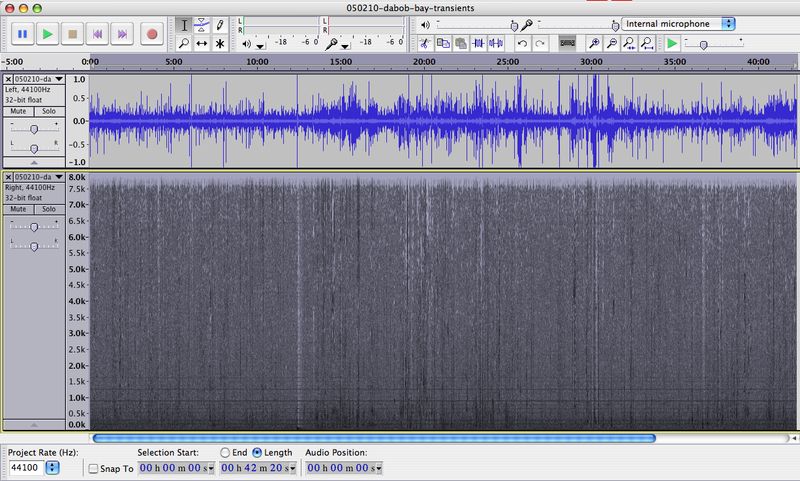 Here is a data directory with a sampling of the signals present in 42-minute-long recording. Here’s hoping our Northwest Navy neighbors are able to acquire and release additional recordings like this one that help us understand and enjoy the marine environment. Animals (data compiled by John Durban and Graeme Ellis): These are six killer whales, known to be part of the ‘west coast transient’ stock that ranges between the coastal waters of SE Alaska and California. These particular animals have been most frequently documented in SE AK and British Columbia. This group is comprised of two adult females [(T71 and T124A, both more than 20 years old), each with two offspring – one older offspring per femaile (T71A — 10 years, T124A1 — 9 years) and one younger offspring per female (T71B and T124A2, both around 5 years)]. These two ‘matrilines’ have not always been seen in association with each other. Visual observation during the recording: The animals were off Bolton Peninsula when first sighted. They were staying in one location moving back and forth over one area, which is considered feeding behavior. They then moved as a group from Whitney Point south, along the west side of Dabob Bay and continued south out of Dabob Bay. As a standard operating procedure, the NAVSEA Keyport does not conduct active acoustic operations in the presence of whales at any NAVSEA Keyport test range. The Dabob Bay Range Site is staffed during normal working hours by NAVSEA Keyport. Our range operators are trained by NOAA to identify marine mammals. NUWC maintains and operates the range on Dabob Bay where this recording was made. Their purpose is to test and evaluate undersea systems in support of research and development, and in support of maintenance and upgrade of existing systems. There were no operations scheduled the day this was recorded, and all scheduled testing activities were postponed for several days until the range was clear of the transient Orcas.